Gardeners who enjoy growing indoor plants often include a schefflera plant with their indoor groupings. These tropical plants will grow prolifically as long as they have ample indirect sunlight and adequate moisture. After several years in the same pot, you must repot schefflera house plants to prevent them from becoming root bound and enable them to continue growing and thriving. Watch the schefflera plant for indications it is ready for a larger pot. Examine your schefflera plant so you can determine when you need to repot it. When you see roots on the surface of the soil, this indicates that the schefflera plant needs a larger pot. Fill the new container with 2 inches of fresh potting soil. Remove the schefflera houseplant from its existing container and place it into the larger container. Carefully add more potting soil around the plant, filling the container with fresh potting soil. Water the newly repotted schefflera houseplant generously after repotting it. Place the plant in an indoor location with southeast or southwest exposure. Begin fertilizing the schefflera plant one to two weeks after repotting. Plant schefflera in a heavy planter to prevent the top-heavy plant from falling over. Use a standard potting soil with good drainage. Keep the plant in a location that receives bright, indirect sunlight throughout the day. Keep schefflera at a temperature of between 65 and 70 degrees F at night and between 75 and 80 degrees F during the day. Place a thermometer near the plant to ensure the temperature stays in the appropriate range. Check the top inch of soil daily for moisture. Apply water to the schefflera plant whenever the top 1 inch is completely dry to the touch. Never allow the soil to dry out completely or become soggy. Allow the top 3 inches of soil to dry out before watering during winter. 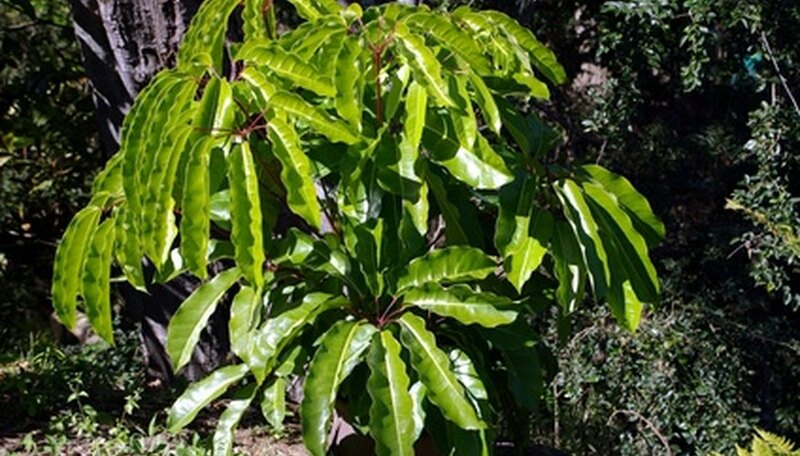 Feed schefflera once per month using a balanced 10-10-10 NPK fertilizer. Water the plant before and after fertilizing to prevent nitrogen burn. Apply according to the directions provided by the manufacturer. Use a spray bottle filled with tepid water to mist the foliage of schefflera once a day to emulate the humidity of its natural environment and to prevent spider mite infestation. Mist in the morning so the plant dries before the temperature drops. Position your dwarf Schefflera plant in bright, indirect light, such as beside a sunny window with dappled or filtered light. Don’t place the plant in direct sun or its leaves will burn. Water your dwarf Schefflera once or twice each week, allowing the potting soil to dry out before watering. Provide water until it begins to drain from the bottom of the pot and discard any excess water from the drainage dish. Prune your dwarf Schefflera’s stems back to the main stem when the plant begins to outgrow its bounds. Schefflera plants can withstand heavy pruning. Treat your dwarf Schefflera plant for spider mites by misting the foliage with soapy water once or twice each week. If the spider mite infestation persists or is severe, treat the plant with an appropriate miticide according to the directions on the label.